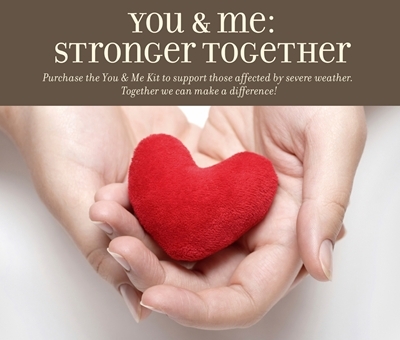 Purchase the You & Me kit to help those affected by the severe weather. Together we can make a difference! SEVERE FLOODING, TORNADOES, AND STORMS have affected the lives of thousands across the United States, but together we can make a difference. During the month of June, purchase the You & Me scrapbooking kit for only $15 (a retail value of $34.95), and a portion of the proceeds will be donated to the American Red Cross Spring 2011 Floods and Tornadoes relief operations. With the You & Me kit, you’ll create two fully embellished two-page layouts using the included instructions, papers, D-size stamp set, and accessories. At only $15, this kit is more than 50% off the retail price. You’ll win by getting the kit at a phenomenal price, and those in the weather-devastated regions will benefit from your charitable contribution. Together we can make a difference; together we are stronger! To see a video of how easy it is to create the step-by-step techniques and layouts in this kit, click here. And don't forget, there are many new items added to our clearance sale! Up to 80% off of your favorite Close To My Heart products! Check it out here and add a You & Me kit to your cart for only $15 too! 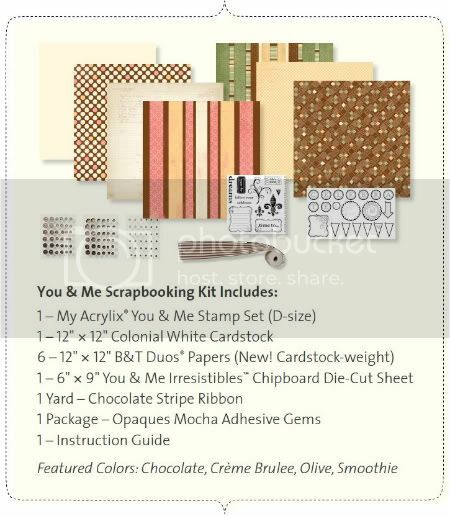 The You & Me kit and sale items would make excellent Christmas or Birthday gifts for your scrapbooking family and friends! Stock up now! !